We need your help! Is there someone who would like to help out on Tuesday nights during the meeting and at the lecture? We really need some volunteers …. Added advantage is helping book future teachers!!! In this one-hour program, Bonnie shares her study and findings about the development of The Modern Quilt Guild. This early 21st Century quilting revival has taken the quilting world by storm with a fresh, new look characterized by a variety of factors. This slide show and lecture, along with a few examples of actual quilts, traces the founding of this international phenomenon and its roots in social media. This workshop presents a laid-back approach to design, forcing quilters to work with what they have. Participants will make improvisational quilt blocks by combining a few of their own scraps with those supplied in class. 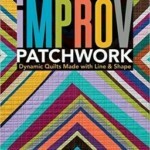 We will let loose with wonky strips and off-kilter squares in this fun-filled journey down the improv road. This class works well for those who have always wanted to bring out their inner abstract artist. This workshop is best for those who will allow themselves to be open to asymmetrical, abstract, and generally ‘wonky’ designs. The Boutique is open to all members to sell their wares at the November guild meeting. This year it is from 6 to 7 p.m. on November 14 in the lower lobby. The table fee is $25, and members can share a table with another member. If you would like to participate, please contact Mary Cannizzaro at boutique@northernstarquilters.com. Super Saturday is scheduled for February 17, 2018 and we looking for instructors for the day. It will take place at the same place as last year, the First Presbyterian Church of Yorktown on Crompond Road (Rte. 35/202 and 132). We need to start lining up the classes. Please think of what you can do to teach your fellow members. If you have acquired special skills by taking a class or learning from a book, consider passing on your knowledge. Traditionally, it is a fun-packed, highly educational day which includes a lunch provided by the guild. Please contact Pooa Bloomberg at supersaturday@northernstarquilters.com if you are interested in teaching a class. January’s Program will feature an assortment of exciting Short Demos by many of our talented members. If you have a technique you’d like to share please contact Donna Chambers. January. Remember one Quilters Ugly is another Quilters Beautiful Masterpiece! So bring on the Ugly..
Long Arm Sig – Diane Linker – The next Meeting will be on October 14th at Kathy Vanacoro’s home. Landscape Sig – Don Gough – Next meeting will be Saturday,October 21st from 1pm to 3pm at the FABRIC MART quilt shop in Yorktown. ImPrOv Sig – Meg Mooar and Jane Eyes – IMPrOv will always meet in the back of the cafeteria at 5:45. Please bring samples and inspirations to share with the group. Newcomers are always welcome! EQ Sig – Mary Cannizzaro – There will be no October EQ SIG. 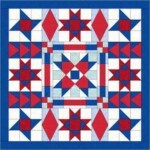 Attached is Helen Boland’s quilt that she designed after the September SIG meeting and she is new to EQ. Great job Helen! Meetings for the year have been scheduled at Fabric Mart in Yorktown on October 11, November 8, December 13, January 10, February 14, March 14, April 11, May 9, and June 13 from 10am to 1pm. A couple of projects that have been discussed to work on include the pattern by Violet Craft of either a Lion, Elephant or Giraffe and the Judy Niemeyer Feathered Star pattern. Please feel free to bring other paper piecing projects that you are working on.